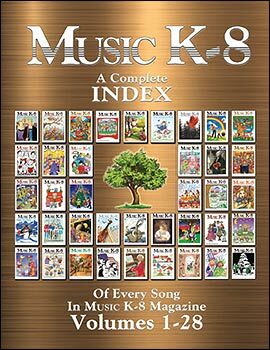 Enjoy the ease and convenience of our interactive magazine index, which contains every song published in Music K-8 magazine through Volume 28. By clicking on any title, you'll be taken to a page on MusicK8.com where you can listen to a sound excerpt and read more about that song. This PDF includes both an alphabetical and a subject index. We strongly recommend downloading the PDF and viewing it in Adobe Acrobat Reader, rather than viewing it in your browser window. These downloads are intended for use by teachers in their classrooms and for performances. Commercial use of any songs, images, or documents in the Downloads section or any other section of MusicK8.com is expressly forbidden. All songs and images are Copyright ©1997-2019 Plank Road Publishing, Inc.
<< Back to Downloads main page. All Downloads from Music K-8, Vol. 28, No. 1.